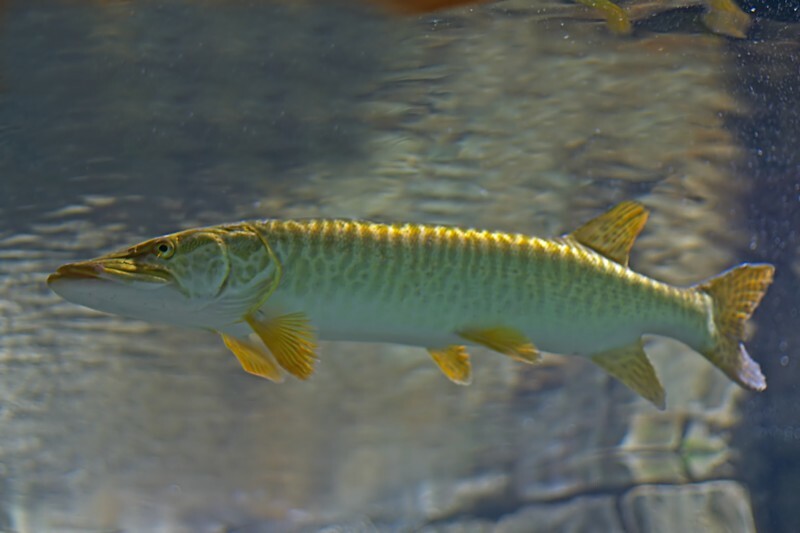 Muskellunge are known by several names including the Ohio River Muskellunge, Barred Muskellunge, Unspotted Muskellunge, and the Jack Pike. 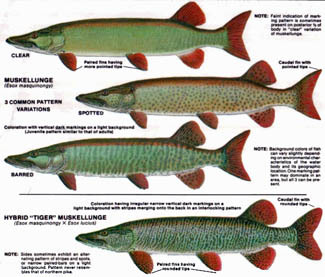 All are the same fish, different name but are commonly called Muskie or Musky, which has nothing to do with musk cologne. They are typically a brown or green with darker bars running vertically from the back down the sides. Sometimes, these bars may break into spontaneous spots, hence the two nicknames above. Interesting is the fact that a fish that lives in turbid waters may lack any markings at all and be a plain light silver. Strange, isn’t it? Whatever their coloring, they are the ultimate freshwater predator. The body is elongated and eel-like with the fins set way back on the body. This is so the fish can attack suddenly and quickly without warning. They can live up to 30 years, grow to lengths of up to 5 feet, and weigh as much as 70 pounds, so they can be a great sport catch! SPECIAL NOTE: The further north you go, the bigger the Muskies! There really aren't any fish like this in fresh water except the northern pike. They do look alike so how do you tell a muskellunge from a pike? Count the sensory openings under the lower jaw bone. 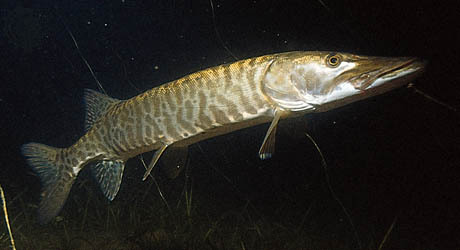 A pike never has more than six there while a muskie will always have upwards of seven. All lakes from as far south as the Tennessee River Valley up through the Mississippi Valley, and all through the Great lakes into Canada potentially hold populations of these fish. They are prevalent in Wisconsin and Minnesota, but have a reputation for being "scarce," for lack of a better word. These fish spawn in the spring immediately after the pike spawning period. So that puts the spawn generally between April and June. Don’t know why that is, but it is. I don't second guess nature, as it always knows best. As a young little Nemo, these potential pole snappers feed on plankton and other yummies like that. When the mouth forms completely, they begin to feed on other fish. It is amazing that even young ones will take prey that is a full 1/3 of their own size. The life of the Muskellunge is all about feeding. They have two separate homes; one shallow and one deep. They will prowl incessantly between the two looking for food. They eat constantly as a result. These are one of the tastiest critters in the Great Lakes area. They can't be beat when cooked over an open fire with simple lemon, butter, a little salt and pepper for tastem and some Old Style beer to wash it down. See you at the campfire….